I have two seconds to write this before a meeting, so excuse the hurried tone. I walked home from the museum yesterday and as I reached the base of the CNA Insurance building, I stopped and watched the skies for a bit. This building seems to be a favorite chick flight training spot for Herc and Max. I know this from my own observations last year, but mostly from the stories of Dan Cozza, Preston Kendall and all the other folks that have been watching the MCC falcons for years. I was hoping I might finally see signs of Max and Herc’s chick. It wasn’t long before three falcons came swooping in. Although they were up fairly high, I could see that at least one had a very white breast. The three flew lazy circles to the south of the CNA for awhile before one stooped to the west and went out of sight. 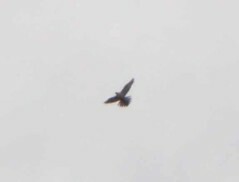 Of the two remaining birds, one was markedly larger and when it flew down a bit, I could see it was another adult. The two began a game of chase – stooping and then rising up into the air to turn some lazy circles. Then, the adult landed on a windowsill ledge on the CNA building and took right off, only to be replaced by the smaller bird. This went on for five or six landings and takeoffs before the adult suddenly stooped to the west and went out of sight too. The smaller bird cruised around for a bit more and then flew off to the west. I followed their progress, which finally led me to the airspace above the MCC. I saw one adult perched on the camera post at the top of the MCC and scanned the buildings for the other two. It didn’t take long before I spotted them on top of the AT&T building. An adult (I could easily see the white breast) was busy plucking some prey and a juvenile (I could easily see the buffy, streaked juvie colored breast) was sitting on a ledge above it, making all sorts of noises. The juvie came down to beg a couple of times, but the adult chased it off. Finally, the adult left with the prey in talon and the juvie took off in pursuit. 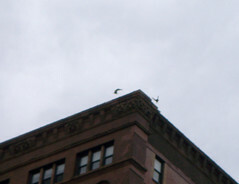 They took a couple of circuits around the airspace before the adult landed on the corner of the Manhattan building and began eating again. The juvenile swooped around, overhead, crying, but every time it tried to come down, the adult would chase it away. Every once in awhile, the adult would fly off, leaving the prey to the juvenile, but not for long. After the juvenile got a few bites, the adult would come back down and chase it off. After a few of these exchanges, the adult began taking the prey with it when it took off and the juvenile would take up chase. It was a really interesting interaction to watch. I had nothing with me, save my small snapshot camera (hence the lack of quality of these pictures). Therefore, I could not see legbands so I cannot say with 100% confidence that this was Herc, Max and Chick One (or two, if Chick One is actually the female that is at SOAR now). However, considering where the three were hanging out, I can say I am 99.9% sure it was our MCC family. So good to see Herc, Max and the chick! In other news, the museum pair made a brief visit yesterday. I had email from Mary saying that when she came into work (at Oh-God:30), they were up on the south triangle making all sorts of “kak-ing” sounds to one another. I wonder where those two crazy kids have been all breeding season? ~ by Steph on June 29, 2007.